That coming from someone that has only lived in The States, but still… does it get any better? Sitting on the patio, grilling some grub, enjoying a cold one. I don’t think so. Shaddock IPA – A solid, light IPA with a great hoppy nose and mildly bitter body (50 IBU). This is a classic IPA that I would buy again. Marionberry Hibiscus Gose – If you are in the mood for something a bit fruity, the Gose has the goods. It is a very mild berry brew with the hints of dark berries throughout the taste. Want a beer that looks more like a wine cooler but isn’t one? Here you go, sir, here you go. 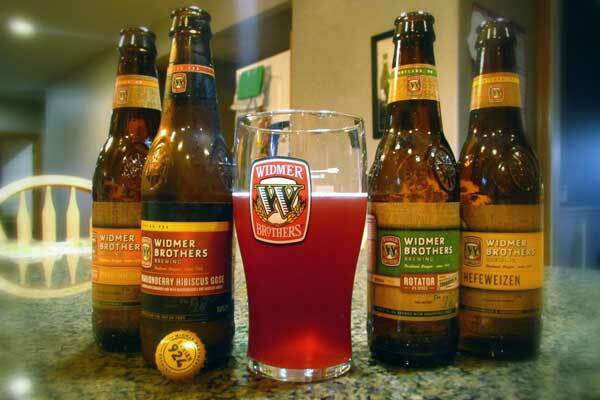 Widmer Hefeweizen – A classic of the genre. Widmer Hefe has been around for as long as I can remember and it turns out a consistently solid experience. I quite enjoy a citrus wedge with this beer, pick the citrus to match your fance. All in all, you can’t go wrong as long as you match your tastes with this bunch. For me, the IPA takes the cake. Others might want to go a little mild. This entry was posted in Summer Ale, Widmer Brothers and tagged BBQ, Citra Blonde Summer, Marionberry Hibiscus Gose, Shaddock IPA, sunshine, The American Way, Widmer Brothers, Widmer Hefeweizen. Bookmark the permalink.